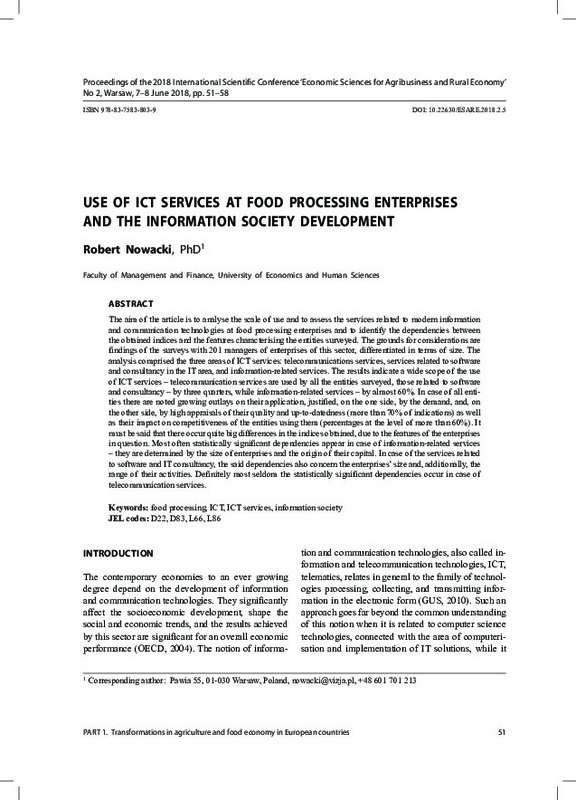 The aim of the article is to analyse the scale of use and to assess the services related to modern information and communication technologies at food processing enterprises and to identify the dependencies between the obtained indices and the features characterising the entities surveyed. The grounds for considerations are findings of the surveys with 201 managers of enterprises of this sector, differentiated in terms of size. The analysis comprised the three areas of ICT services: telecommunications services, services related to software and consultancy in the IT area, and information-related services. The results indicate a wide scope of the use of ICT services – telecommunication services are used by all the entities surveyed, those related to software and consultancy – by three quarters, while information-related services – by almost 60%. In case of all entities there are noted growing outlays on their application, justified, on the one side, by the demand, and, on the other side, by high appraisals of their quality and up-to-datedness (more than 70% of indications) as well as their impact on competitiveness of the entities using them (percentages at the level of more than 60%). It must be said that there occur quite big differences in the indices obtained, due to the features of the enterprises in question. Most often statistically significant dependencies appear in case of information-related services – they are determined by the size of enterprises and the origin of their capital. In case of the services related to software and IT consultancy, the said dependencies also concern the enterprises’ size and, additionally, the range of their activities. Definitely most seldom the statistically significant dependencies occur in case of telecommunication services.